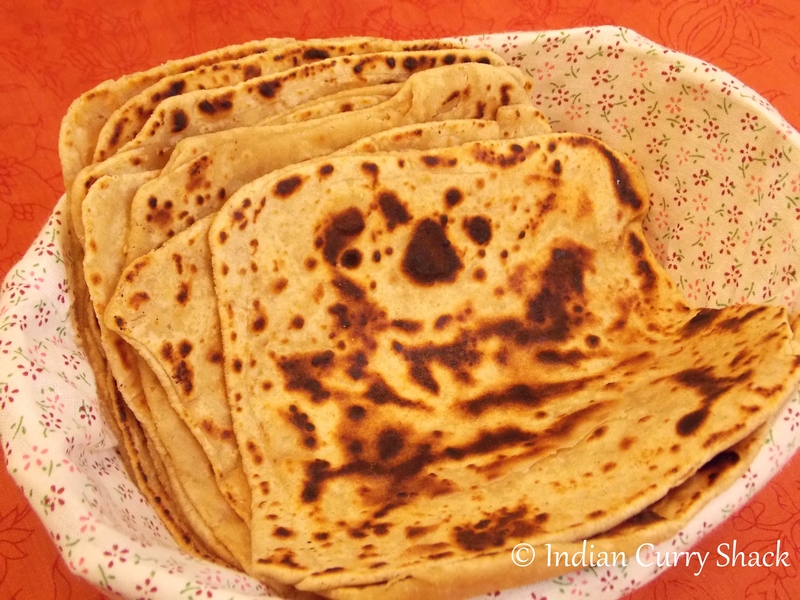 A variety of Indian Flat Bread made with whole wheat flour. It is layered and crispy. Quite versatile. Goes wonderfully with veg and non-veg curries or with natural yogurt or salted butter or simply roll and dip it in your cup of hot milk tea and relish it. To make the dough – Take Whole Wheat Flour (Aata) in a deep bowl. Add 1/2 teaspoon salt and 1 tablespoon Clarified Butter (Ghee) or Refined Cooking Oil. Add water little by little and knead into a semi-soft dough. Divide the dough into 8 equal parts and give each part a round (ball-like) shape. Take one dough ball, flatten it by pressing it between your palms or against roti making board (chakla) and coat it with dry whole wheat flour (dry flour coating will prevent it from sticking to rolling pin and board). Roll each part to a small roti using the rolling pin (4-5 inch diameter circle). Brush with melted ghee or cooking oil. Now take one side and fold inwards to the centre. Fold again from the opposite side, then again from the two ends, layering the folds on top of each other. Now sprinkle some wheat flour and roll out into a square paratha. Heat a griddle (tava) and cook the paratha on both the sides, using a little ghee or refined oil, till brown spots appear on both the sides. It may be required to flip 1 to 3 times to cook properly. Transfer the parathas to a plate and enjoy with natural yogurt or butter or with some veg or non-veg curry or simply roll and dip it in your cup of hot tea and have.